I'm a sucker for words like potion, tincture, balm, and elixir. In my mind I can picture myself in a long, colorful gypsy skirt, a flowy peasant blouse, and bare feet. Gathering bundles of wild flowers and herbs; carefully peeling bark from medicinal trees and digging healing roots from the earth. I see heavy glass bottles with frosty glass or cork stoppers amongst jars, tins, canisters, pots, and droppers in various sizes. My well-loved mortar and pestle sits atop an ancient butcher block with a dip worn in it from years of use. Dried lavender, yarrow, purple cone flowers hang amidst the herbs, garlic, and chiles on the wooden rafters. Gnarled roots of goldenseal, ginger, and licorice are wrapped in cloth and tucked into baskets on cool, dark shelves. I'm pretty sure I was meant to be a shaman. Or a healer in some form. So, perhaps you can see why a recipe containing the term "elixir" drew my attention. Although I used a blender instead of a mortar and pestle to coax the sweet juice from a golden pineapple, the addition of warming ginger and cayenne reinforced the images in my head. This blend...this elixir...will warm your body from the inside out on a cold day. If you're sensitive to chile peppers, be aware of the potency (oooh, that's another great word...potency) of your cayenne. If it is nice and fresh, you'll get a fantastic burn on your upper lip for hours to come. Purée pineapple cubes, ginger, and water in blender until smooth. Strain through a fine-meshed strainer into bowl, pushing down on the solids to extract as much liquid as possible. Discard pulp and return liquid to blender. Serve over ice and garnish with fresh pineapple wedges or rings, cinnamon stick, or lime wedges. 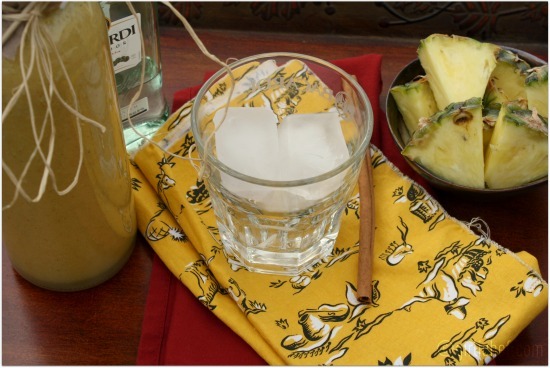 For a warming cocktail with the sweetness of pineapple, add a shot of rum to the bottom of the glass before pouring in the elixir. Heather this look amazing and delicious!!! love it! Mmm! This makes me want to run away to a warm island somewhere and feel the sunburn a bit. A girl can dream ... right? Ha! When I read the title I thought..."Ooo an elixer, I just have to read this" then that's what you wrote about...elixer, I like the other terms too. It sounds so exotic? romantic? Anyway these flavors in your elixer sounds perfect for me, with or without rum! Just what I need right now---sleet all morning, now snow and more snow. This is a perfect elixer!!! Just wonderful and very refreshing, I bet the flavors is like a "holiday" taste hahahaha.... Just as nice as the name...10 out of 10! This looks amazing, and I could use some of it today. Coconut milk, pineapple and ginger...sounds so delicious! Um. Yum. Of course this is YOUR post. I love that word, too. Elixir. What a great combination, Heather. It's been so grey here. Your elixir would brighten the greyest of days. The picture you painted sounds great, long flowing skirt, barefoot, and warming up with a glass of this. So yummy Heather! This sounds delicious. So happy to have found your blog through tasty Tuesday. I love that word, 'elixir'! This sounds wonderful, with or without the rum. I like that it has the pineapple for a taste of summer alongside the lovely warming seasonal spices. Thank you for sharing this delicious elixir with the Hearth and Soul hop. Wow, looks fabulous and I just happen to have everything to make this delicious drink - YEH and thanks! I'm thinking this would make the BEST post-running recovery smoothie. So YES you really are a healer! I want one glass too! Elixir, oh loving this already! pineapple,ginger,coconut and cinnamon.. what a combo! Pineapple...count me in. Hey, what's this Camp Blogaway you have on your sideboard here? Inquiring minds want to know. Can't wait to get that new cookbook and we'll all be cooking and baking together - woo-hoo!! Click the button..it'll take you to the website. So excited! Are you talking about the Flatbreads & Flavors cookbook? I made the pork & tortillas today- tasty! This looks so refreshing and tropical! 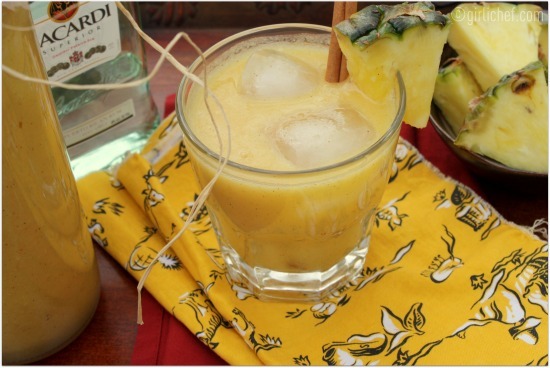 Just what I need to pull me from this winter funk :-) I love the combo of ginger and pineapple. This speaks to my soup; I can almost taste the goodness. I absolutely love this! It sound simply amazing! Fabulous! I'm convinced. This drink looks fantastic and I know I would love all those wonderful flavors. Ginger and pineapple...how yummy and refreshing is that!!!! Oh wow.. this concoction sounds amazing!! I would definitely add the rum.. maybe a pass on the gypsy skirt for me.. i'm already pear shaped.. but bear feet in the sand.. yes! I wonder how this drink would be warmed.. because it's a bit nippy here and I could totally imagine this warm too! thank god I'm over 18 and I canhave this with rum, it looks so refreshing and delicious! I have a drink book I bought partially because the word elixir in the title seduced me. ;-) I tagged this recipe to make in Veg Times and I am pleased to see and hear how fabulous it is. Lots of lovely words there indeed! I can't wait to try this elixir, I feel so sluggish today..
Whoah Nelly! 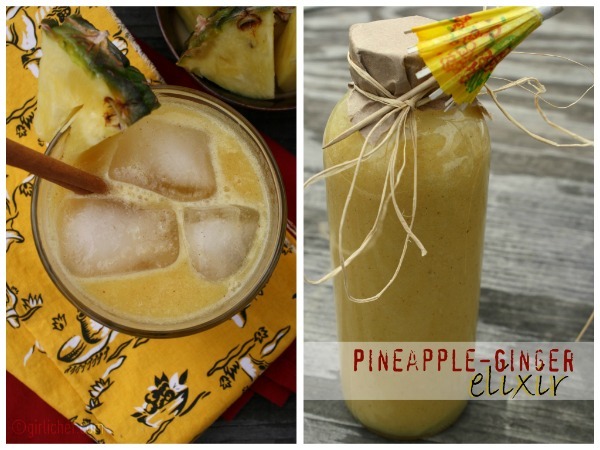 That pineapple ginger elixir sounds out-of-this-world!! I agree, those old timey apothecary terms have me positively enchanted! Thank you so much for always having something amazing to share on "A Little Birdie Told Me..." Tuesday! I can see that this could be really, really addicting!